I work as an inspector of products. I was at a safe but close distance to a worker. The worker started his work, and I looked the other way. My boss, seeing this, complimented me. None of the three of us are corrupt, and there is no secret agreement between any of us. This entry was posted in games, story and tagged conundrum, creativity, question, writing on November 19, 2017 by FlowCoef. 3 (!) years ago, I mentioned a PC game (actually a Macintosh game) called “3 in Three”. Now, because of technological advances, we have a ready-made way of playing it: by emulation! Misfit vowels sounds like something from elementary school English. Maybe like Number Munchers, but different? Speaking of which, 3 in Three isn’t supposed to be educational, but neither are crossword and the like puzells. This entry was posted in advertising, farce, games, gaming, humor, Macintosh, software and tagged 3 in Three, Cliff Johnson, misfit vowels on September 22, 2017 by FlowCoef. More posting about that favorite “grand strategy” game Europa Universalis IV or “EU4”. This entry was posted in games, gaming and tagged EU4, EUIV, Europa Univeralis 4, Europa Universalis IV, image criticism on July 26, 2016 by FlowCoef. Continuing from my previous post about EU4, I found another interface oddity. Some context: In EU there are “provinces”, which are similar to cities in the Civilization games. Some of these have fortifications that require you to siege them. To do this, you need to have a certain number of troops in the province. If you do not, you can’t besiege the place. Too few troops to siege this province. Most of the iconography in this image is apparent to the player, though possibly highly confusing to a newbie. The red icon though I cannot tell the meaning of. It just looks like a squiggle with an exclamation point after it. This entry was posted in games, gaming, Interface Hall of Shame and tagged EU4, EUIV, Europa Univeralis 4, Europa Universalis IV, UI on June 15, 2016 by FlowCoef. Suppose you had a graph. The x-axis is time, either real or game time, whichever is appropriate. The y-axis is likelihood of giving up and restarting or just quitting and not coming back. This entry was posted in campaigning, games, gaming, illustration, imagination, math and tagged graph, personality, question, strategy on April 3, 2016 by FlowCoef. I had posted a week or so ago about a “grand strategy” game I play. It is called Europa Universalis 4, or “EU4” for short. Essentially you pick a country (doesn’t have to be in Europe) and try and either conquer the world, conquer parts of the world, get achievements, or just survive from 1444 to 1821. The game is notoriously moddable, but one thing I noticed that I had overlooked for ages because it is so well hidden, is that you can rename provinces you own without having to change text files. Click the province to open it. Type in what you want. The change is immediately visible on the map and also in all dialogs. You can change the provincial capital as well. For some reason, the fact that it is editable is nowhere indicated in the UI, which is strange to me. This entry was posted in games, gaming, Interface Hall of Shame and tagged EU4, EUIV, Europa Univeralis 4, Europa Universalis IV, UI on April 3, 2016 by FlowCoef. I’ve been playing a so-called “grand strategy” computer game for years now. Not the same game itself, but the same software. Unfortunately I’ve gotten something of an addiction to it. Nothing I can’t set down when I need to, which I have when I needed to work on something else. Essentially this game involves playing as the head of a country and trying to surpass other countries over several centuries. There are the usual wars, but also diplomacy and finantial concerns, local affairs and multiple balancing acts to keep things going smoothly. Anyway, I’ve been playing as England/Great Britain and got several (game-time) centuries into it before a “disaster” happened. These are preprogramed events that are meant to seriously challenge the player. Well, I’ve got quite beaten and feel like giving this particular game up. I’m seriously outgunned and have multiple rebels going off everywhere and no way to fight them off. This is making me sigh for two reasons. First, I’ve put alot of work into this game so I wanted to carry it to a conclusion. I may yet, I don’t know. Secondly, up until now it had been going really well, so I felt a little like I was cycling down hill and suddenly had a blowout! Fortunately I can distract myself with the phone interview I’m having tomorrow. This entry was posted in games, gaming and tagged annoyance, job hunting on March 24, 2016 by FlowCoef. I’m guessing this is pre-1973 and the “China” refers to what we now call Taiwan. The character for “State” is written in traditional Chineze1, so I don’t think it is “mainland” Chineze. All this aside, it is a little strange and somewhat freaky. It cost 1.50 USD according to the price tag on the back of the box. 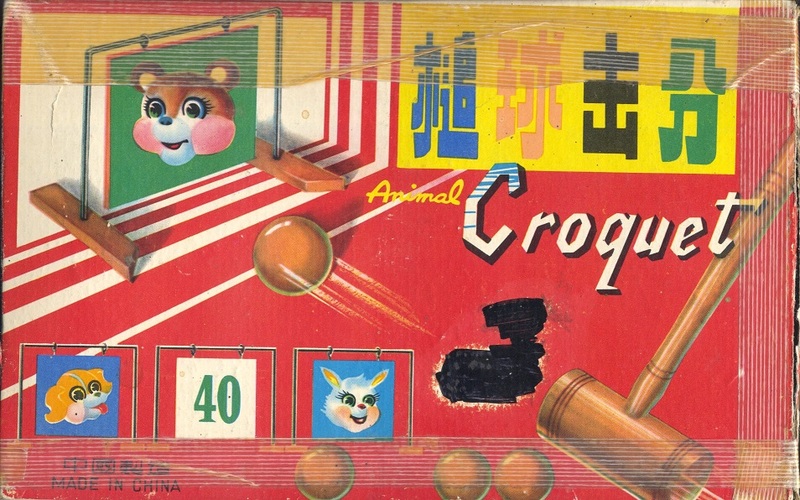 Note the strange, possibly custom, font for “Croquet”. This entry was posted in art, games, scary, toys and tagged artifact, croquet, inexobs on June 1, 2015 by FlowCoef.